I have a new book coming out this summer! What types of law careers will allow me to make a great living, have a great life with a schedule that’s mine to control AND serve clients in a way that’s actually fulfilling? Is estate planning really the best way to use my law degree to help people? How can I do estate planning in a way that’s truly meaningful and systematized and not compete with the massive rise in online document preparation services? 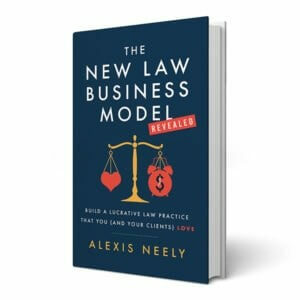 The New Law Business Model Revealed: Build a Lucrative Law Practice That You (and Your Clients) Love. I asked myself these questions repeatedly because I knew I was not just here to help people pass on their money after they died, or to help already rich people save money on estate taxes, or to create estate plans that I knew would rarely even work when families needed them. I knew I was meant for more. But, I didn’t know what that meant. Or what that more was. So, I tried to run. Away from myself as a lawyer. Away from serving lawyers. Away from what would be required to actually grow up and be a leader. Fortunately, estate planning and the New Law Business Model kept pulling me back, showing me more, asking me to look deeper and to see what I couldn’t initially see on the surface. Today, I finally see what it was all about. And, I’m going to be sharing it in detail in my book with the hope that you find the highest purpose and meaning for your law degree, with a business model to support the life you deserve to have. Estate planning is not just about passing on your money when you die, or saving money on estate taxes, or even form documents. When done right, by lawyers who care and have the business systems to support their caring, it’s about the true meaning of inheritance, and purpose and legacy. That’s why we call it Life and Legacy Planning. Estate planning is about good parenting. And learning from our parents. And growing up. And, of course, it’s about dying well. And living even better. It’s not just for old people, or sick people, or even rich people. It’s for everyone. And it truly matters, when done right — which is so different than the way we were taught (or perhaps not taught) in law school. It’s about life and love. I will explain it all in depth, along with laying out the new law business model that supports you to build a law practice that makes estate planning lucrative and fulfilling, in my new book. One of the best new books for lawyers and law students is coming out this summer! The New Law Business Model Revealed: Build a Lucrative Law Practice That You (and Your Clients) Love will give inspired lawyers the roadmap for using their law degrees in a way that truly matters. I’d be so honored to share it with you! To that end, if you’d like to be on the early notification list for when the book is released, as well as be entered to win one of the 50 copies we’ll be giving away to members of the NLBM Tribe, just email us at [email protected], and introduce yourself. I look forward to hearing from you, and helping you to turn your law degree into your single most valuable asset, for yourself and for your community.